One of the earliest climate change novels. With uncanny skill, Arthur Herzog, best-selling author of The Swarm and Earthsound has blended fiction and fact into a terrifying and highly plausible story of the near future: a time when tensions mount as ecological doom beckons. Please note that this book was published in 1977 by Signet (ref.) and might be the first book of its kind that deals with anthropogenic global warming. The author’s widow, Leslie, wrote to say that he wrote 27 other books in his lifetime. I’m not sure how many more deal with cli-fi, but if you enjoy this book, you might like his others. Please see the Official Website of Arthur Herzog. 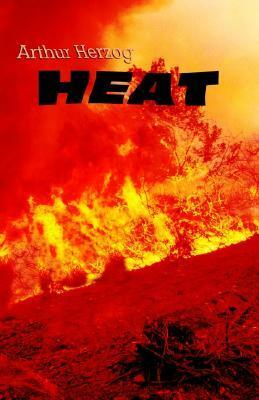 Arthur wrote Heat in 1977. So again 4 years before I met him, but I think about the book, when I note the drought in the West that has prices of meat up 17% and when I check http://flood.firetree.net/?ll=43.3251,-101.6015&z=13&m=7 (the interactive flood map), which one can lower or raise sea level to see if the sea will be over your particular home. If I had the time I would check back on the people Arthur interviewed for the book all people he kept up with year after year to find out their opinion on global warming now: National Oceanic and Atmospheric Administration: Dr. J. Murray Mitchell, Ed Weigel, NOAA Geophysical Dynamics Laboratory, Princeton, New Jersey; Harold Frazer, NOAA, Environmental Research Laboratory, Boulder, Colorado: Carl A. Posey, Sam O. Honess. Institute for Environmental Studies, University of Wisconsin: John Ross, Drs. Alden McClellan, E. W. Wahl. National Academy of Sciences: Drs. Charles E. Fritz, John Perry. Center for the Study of Short-Lived Phenomena, Smithsonian Institution: Charles Citron, Shirley Maina, David Squire, James C. Cornel (I might note that the Center, with reports on natural events, partially inspired CRISES), National Center for Atmospheric Research: Dr. Stephen Schneider. Dr. Jerry Grey, Brad Byers, Mae Megaha, Charles Crum, Dr.Gregory Herzog, Naomi Rubenstein, William E. Bernard, Jr., Judy Peiffer, Dr. Michael Bad, Diana Grant. Special thanks to Drs. Mitchell and Grey and to Ross Wetzsteon and Don McKinney for reading the manuscript. And especially to Dr. Perry. With uncanny skill, Arthur Herzog, best-selling author of The Swarm and Earthsound has blended fiction and fact into a terrifying and highly plausible story of the near future: a time when tensions mount as ecological doom beckons. Pick’s predictions become a reality as freakish weather conditions prevail: extraordinary tornados and hurricanes, droughts, violent hailstorms, and windstorms and savage waterspouts. “Condition Green” is no longer a theory as destruction runs rampant, but still neither the U.S. Government nor the people will listen. Too late, the result of man’s indifference is everywhere…with only one hope for survival.